Powder characterisation company Freeman Technology is exhibiting the company's universal powder tester, the FT4 Powder Rheometer, at ACHEMA 2012 (Frankfurt, Germany; 18-22 June 2012), and members of the team will be speaking at congress sessions. On 20 June, Operations Manager Jamie Clayton joins forces with Michael Mayer from Azo GmbH to make a presentation focusing on better equipment design strategies for powder processing. They will examine the role of enhanced powder characterisation in promoting greater understanding of the design requirements. On 22 June, a member of the Freeman team will share their experience of a multivariate approach to analysis of powder flow properties, again in the context of achieving better equipment design strategies for powder processing. Visitors to the Freeman Technology exhibition stand will be able to find out more about the FT4 Powder Rheometer and discuss their individual powder processing challenges with the company's expert team. 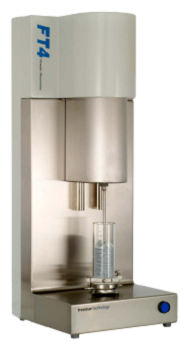 The FT4 Powder Rheometer is a universal powder tester that uses patented dynamic methodology, automated shear cells and bulk property tests, including density, compressibility and permeability, to quantify powder properties in terms of flow and processability. It delivers data that maximise process and product understanding, accelerate R&D and formulation, and support process optimisation. You can visit Freeman Technology at ACHEMA on Stand No. 4.2 F62. Freeman Technology specialises in systems for measuring the flow properties of powders and has over a decade of experience in powder flow and powder characterisation. Expert teams provide detailed know-how alongside the company's universal powder tester, the FT4 Powder Rheometer. Freeman Technology's headquarters are in Gloucestershire, UK, with a wholly owned subsidiary in the USA and distribution partners in China, India, Japan, Malaysia, Singapore, Taiwan and Thailand. In 2007 the company received the Queen's Award for Enterprise in Innovation.